As a soloist and stage performer, he has collaborated with such bands as “Muse (Celtic),” “Hot Rod Chocolate,” “Bottoms Up (Bluegrass),” “Sithean mu Baroc (Baroque),” “Rosa Con Torero (Country Rock),” and performed as a guest artist with many others.He has played at business events, wedding parties, school concerts, and continues to perform regularly at restaurants and Irish Pubs. 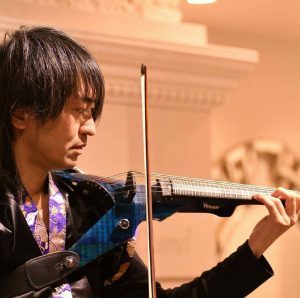 As an interesting self discovery, he found a key for improvement on the violin which had to do with how the instrument fits to the performer’s body frame. He designed an original shoulder rest which he obtained a patent for (patent # 4795901).